We're scheming for the ultimate Lego party next month. We scrolled through the Lego A Day blog--for "research." Free entertainment for as long as your lap can take it. You've probably already seen this, but Amy (momadvice) has a Lego cake on her site. 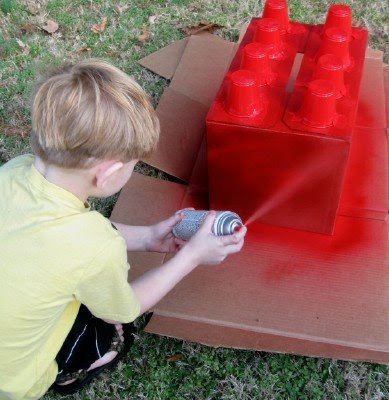 I love the spray-painted "Lego" - very cute! Love the giant lego, but even more? I LOVE that little girl dress. So, so lovely. I sure hope Andrew doesn't get sick for his birthday this year! A Lego party sounds like lots of fun!My son will be 3 in June, and already he's telling me he wants a "Thomas" cake! Lucky you to live where is is warm enough for short sleeves and sandals in January! The huge "lego" is cute idea. Have a fun party, will look forward to seeing what you cooked up. I am so impressed with that big lego! So clever!! Love the picture of you with the 3 kids! 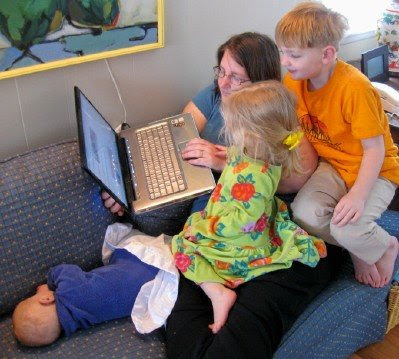 Love the picture of the kiddos in your lap. Your definitely surrounded. They are beautiful. What a sweet scene. Can't wait to see the end results of your research. That reminds we need to start brainstorming for the 5 yo upcoming bday. Great lego link! Thanks so much, my boys will love looking at those. We had lego guys living in our tree this year. My older son was putting one in for fun for my older son each day. We made a cake once using hostess ding dongs atop a rectangular cake and frosted it all red to make it look like a lego. I always feel special when you put in a photo of yourself! Such a rare treat! I am so glad I found your blog! My daughter has to make a Valentines box for her class and I think we are going to make her a big Lego like the one in your picture and put "Lego my Valentine" on the box!